The model of the solar system that says the Earth is in the center. Which theory of the solar system is this? Galileo believed what was in the center of the solar system? 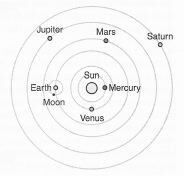 Which of these is the heliocentric solar system? 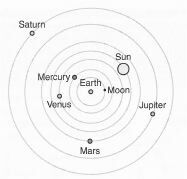 Which astronomer gets the credit for the idea of the heliocentric solar system? Who used his telescope to help prove that the Sun was in the center of the Solar System? Which of these is the geocentric solar system? About 2,000 years ago, this Greek scientist did not believe that the Earth moved and wrote about the geocentric solar system. Which of these did Galileo prove was correct?